Moulin Rouge! The Musical on Broadway tickets can be purchased easily and safely online. Buying your theatre tickets before travelling to New York saves you time, in addition to money. Moulin Rouge! The Musical is the long awaited musical version of the 2001 hit movie of the same name, directed by Baz Luhrmann. It will be performed at the Al Hirschfeld Theatre on Broadway. Experience the grandeur of the cancan and the plush red velvet of the Moulin Rouge now, in New York! Who isn’t familiar with the compelling musical-film portraying a love story that takes place in world famous Paris nightclub: the Moulin Rouge? The musical has made the move from big screen to the Broadway stage. 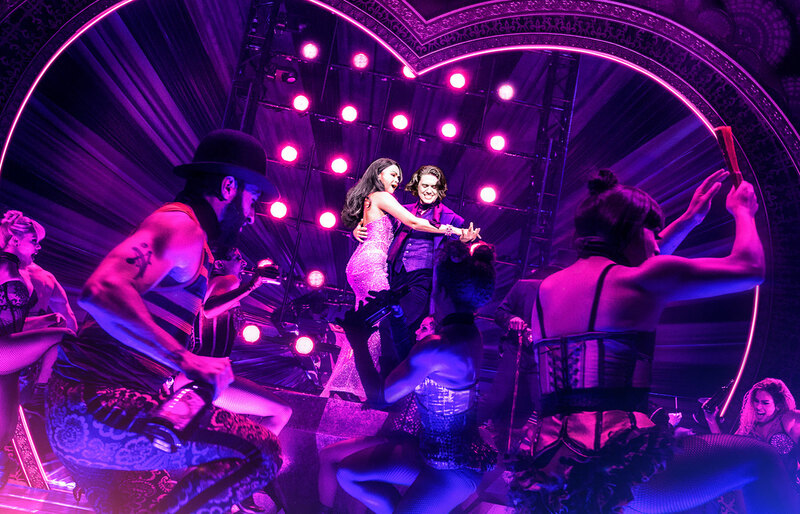 The romance between British writer Christian and Moulin Rouge courtesan Satine is brought to life in the Al Hirschfeld Theatre; which has itself been transformed by 19th Century Parisian decor. It feels like you are spending an evening in Montmartre, where nightclub owner, Harold Zidler has created a magical world of theatre, music and cancan. Satine is one of his courtesans, and she captures the heart of Christian. However, he is not the only one with an eye for the courtesan, and his competitor will not give up without a fight. Music not only plays an important role in the movie, it is also paramount to the Broadway adaptation. Just like in the film, you’ll hear well-known songs that have been redeveloped and integrated into the storyline. The many hits from the movie, such as ‘Come What May’, ‘Your Song’ and ‘Lady Marmalade’ make a welcome return. In addition to some extra numbers which came out after the movie premier in 2001. The winning combination of catchy songs and a compelling storyline make this musical a must-see on Broadway! How to buy Moulin Rouge! The Musical Tickets? 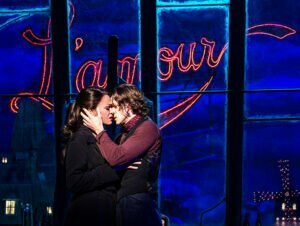 It is easy to buy tickets for the Moulin Rouge via the link below. I recommend buying tickets online before your trip to New York. Why? The website below guarantees great seating in Orchestra or Front Mezzanine for discounted prices. You will save time and money and most importantly you don’t have to stress about finding tickets when you are in New York. A lot of Broadway musicals are very popular and are often sold out. Don’t want to see Moulin Rouge! The Musical?